We recently looked into a series of punch bags so you can bring your fight training home from the dojo. If you use a heavy bag, whether for boxing or martial arts, you need to make sure you protect your hands. Striking a punch bag with bare hands is not recommended and can end up causing you an injury. Today, we’ll briefly review 10 of the best punch bag gloves so you can see at a glance the best options at your disposal. After that, we’ll examine why you need gloves when you’re sparring and then show you what to look out for when you’re on the buying trail. We’ll explore a broad spread of different gloves since everyone has varying needs and budgets. Everlast is an enduring name in the fighting industry and you know you’ll get top-notch equipment at a fairly affordable price. These gel hand wraps are no exception. The knuckle protection and tightly elasticated straps give your hands and wrists all the support they need even if you’re hitting the bag particularly hard. There’s an EverGel protection system in place under the skin so you’ll get more than enough give from even the strongest strikes. Velcro wrist straps make the gloves a cinch to pop on and off while also helping to lock your wrist into place. Available in muted black or 3 much brighter colorways, these Neoprene hand wraps are extremely comfy while also built to last the distance. Cleaning these gloves is a breeze. All you need to do is pop them in the washing machine then it’s ding-ding, round 2! While these are not the cheapest punch bag gloves on the market, they are priced reasonably considering the impeccable brand heritage and the performance you’ll get in return. These gloves are suitable for use MMA training but they are best worn alone since the wraps are low-profile much like MMA gloves. If you’re boxing, these gel wraps can be worn inside your gloves giving you a valuable extra layer of protection. 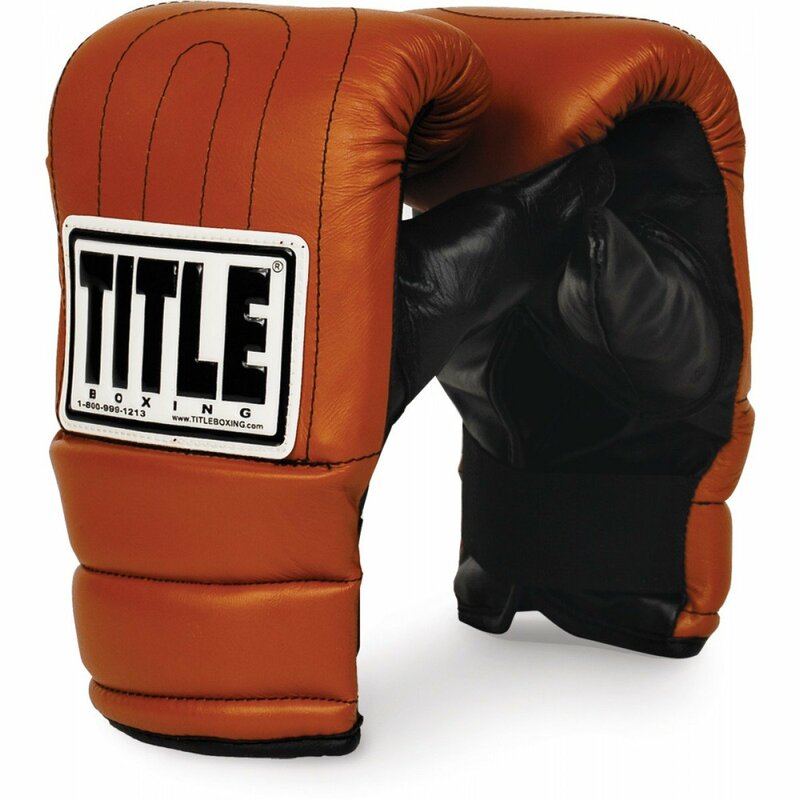 TITLE is a household name in the boxing arena and these old school heavy bag gloves are exactly as described. Everything about these gloves from the design and color scheme through to the no-nonsense performance reeks of tradition. One of the key selling points of these punch bag gloves is the rare combination of affordability and build quality. You’ll get first-class gloves at a third-class price and you can’t ask for much more than that. The nifty pre-curved design allows you to close your fist optimally. The metal grip affords more stability and control even when you’re hitting that bag like a demon. These 8-oz gloves are made from genuine leather so you’ll enjoy a premium feel while the material will keep on going for years if properly maintained. The sizing means they work equally well on light or heavy punch bags. You can slip wraps under these gloves but it will end up as a pretty tight fit. While you won’t end up with the support and protection offered by heavier gloves, if you want a versatile training solution for everything from sparring to bag work in a cost-effective and compact package, these TITLE 8-oz are hard to beat. 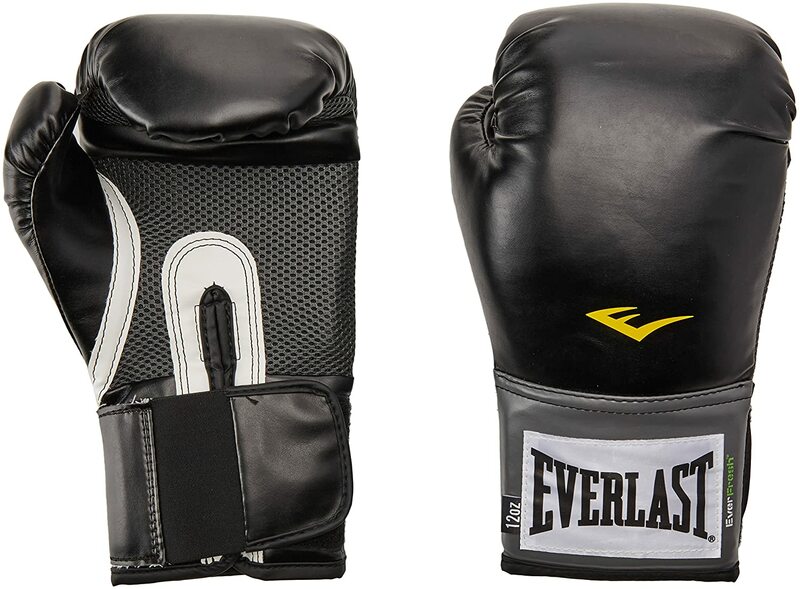 The legendary Everlast makes another appearance with this fine set of gloves suitable for use on the heavy bag. Whether you’re sparring or leathering the heavy bag, whether you’re boxing or following mixed martial arts, these versatile gloves are a one-stop shop and will keep your hands safe from harm without bankrupting you. You can opt for large or extra-large in terms of sizing. The padding is 1-inch thick so even if you’re really motoring away on the punch bag or engaged in an especially rigorous sparring session, your hands will be cushioned from any jarring impact. Everlast market this as closed foam cell technology but the bottom line is your hands will be neatly protected. EverCool mesh ventilation panels let your hands breath even when you’re training hard. 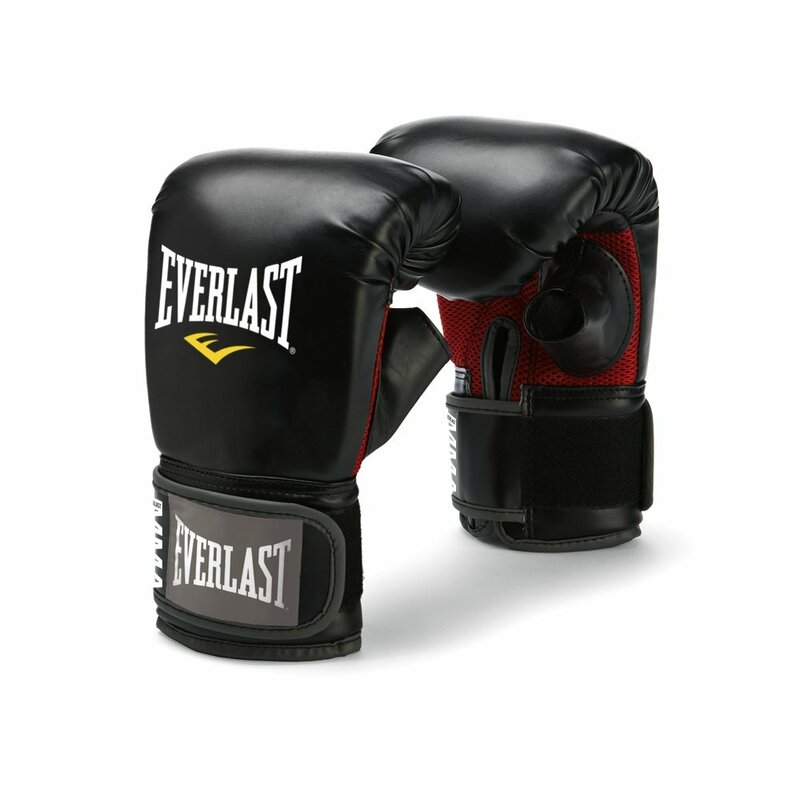 Laces might be a safe and stable solution, but the Velcro enclosures on these Everlast are ideal if time is tight and you prefer the ease with which you can slip these gloves on and off. As with all Everlast products, you’ll benefit from a 120-day guarantee so you’ve got no excuse not to give these gloves a try and see how nicely they shore up your hands and wrists even under heavy fire. You really have got nothing to lose. Cleto Reyes steps up to the bag next with the Mexican firm offering up some superb hybrid gloves that, while not cheap, still represent outstanding value for money. With over 70 years in the fight game, it’s no surprise that this brand has such a committed following. Harnessing the best of the lace system and hook and loop system combined, this hybrid glove is more suited to training than fighting. You’ll be able to get the gloves on and off quick smart while still enjoying the ultimate in stability and support. 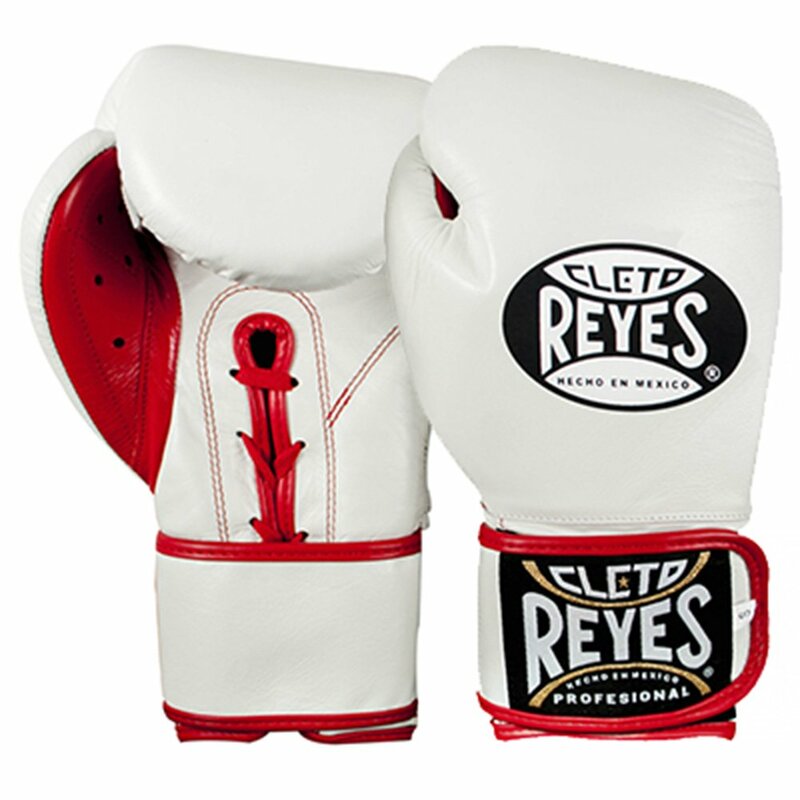 Rather than following the conventional labeling of gloves by weight, the Cleto Reyes come in sizes from extra-small through large so it’s worth trying these gloves before you buy. A rough sizing guide is provided by the manufacturer but it’s worth making sure they fit snugly first. Even if you plan to buy online, it’s not hard to visit a store and give some a feel. The hardwearing but supple leather lining keeps moisture safely out. Wiping them down and keeping them clean is a breeze. The lining could be improved but it’s more than fir for purpose. Stitching is rock solid and the overall craftsmanship of these gloves makes the price worth paying. Inside you’ll get latex foam padding which will cushion your knuckles while ensuring your wrists don’t feel too much backlash. This padding is fairly thin but not too firm. The wrist area feels very supportive taking added stability from the Velcro straps. There’s a thin bar stitched in to help you make a fist more comfortably. The logo-heavy design is otherwise pretty minimalist. If you like a burst of color in the gym, these gloves come in an array of striking schemes. If you’re looking for the cheapest punch bag gloves, the Cleto Reyes hybrids are not for you. If, however, you want to invest in a durable pair of training gloves that will return many happy years of punching, they make an extremely wise bet. 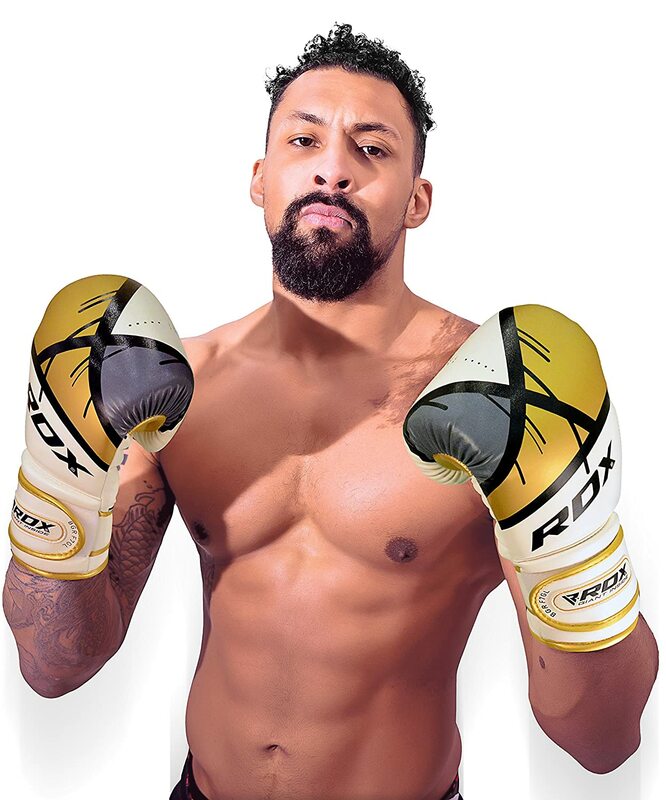 Marketed as punching bag mitts, these leather gloves from the highly reputable RDX deserve a place on any shortlist. The core of these RDX is white and you can choose from a range of color accents to set off the sleek design. Made from Maya leather, you’ll get a winning combo of comfort, lifespan and performance. Extra-thick foam keeps your knuckles well protected even if you’re really battering the bag. You’ll also get a separate block over your wrist with a gel insert so you can safeguard against any injuries with a pair of these punch bag gloves. RSX rolls out their Quadro-Dome technology so that when you strike the bag the force ends up smoothly distributed while reducing any jolting impact. This also stops your hands suffering from the stresses you can otherwise experience. Slipping the gloves on and off is simplified by a lengthy Velcro strap giving you plenty of room for maneuver. The hook and loop enclosure guarantees a nish fit offering ample wrist support even if you pound the bag hard. If you’re after some rugged but comfortable training gloves from a brand you can trust, these RDX mitts are the obvious choice. As Everlast dominate the boxing scene so heavily, it’s no surprise to see another entry from this industry titan with these Neoprene gloves ideal for a session on the heavy bag. Neoprene construction gives you all the flexibility you need when striking along with the durability essential if you want value for money. Padding on the palm gives you all the support necessary for a demanding workout on the heavy bag. The liner is efficient at keeping moisture well away so you can train for hours without worrying about sweat seeping in. The wrist wrap is tightly elasticated so you’ll get it on and off with ease while also benefiting from outstanding support. If you’re looking for flashy and colorful gloves then these Everlast are not for you. If, on the other hand, you want an understate punch bag glove capable of returning many years of training on your investment, these Neoprene beauties make a perfect fit. Ringside make another appearance with these budget-friendly gloves that deliver top-tier performance at a bargain basement price. If you’ve ever trained with poorly lined gloves for lengthy spells, you know how your hands can end up wrinkled as though you’ve been in a hot bath for too long. The Sta-Dri lining on these gloves puts paid to that as the name suggests with all moisture kept on the floor of the gym rather than your hands. Injection-molded foam makes for a very absorbent glove allowing you to focus on your training rather than being distracted by aches and pains from a poorly-padded glove. The pre-curved design helps keep your hands aligned when you’re striking hard. The grip bar helps you keep your fist clenched for longer. The main enclosure is a hook and loop system while wrist enclosures are tapered for added support. Although marketed as mixed martial arts and Muay Thai mitts, the Apex work equally well if you’re a boxer. 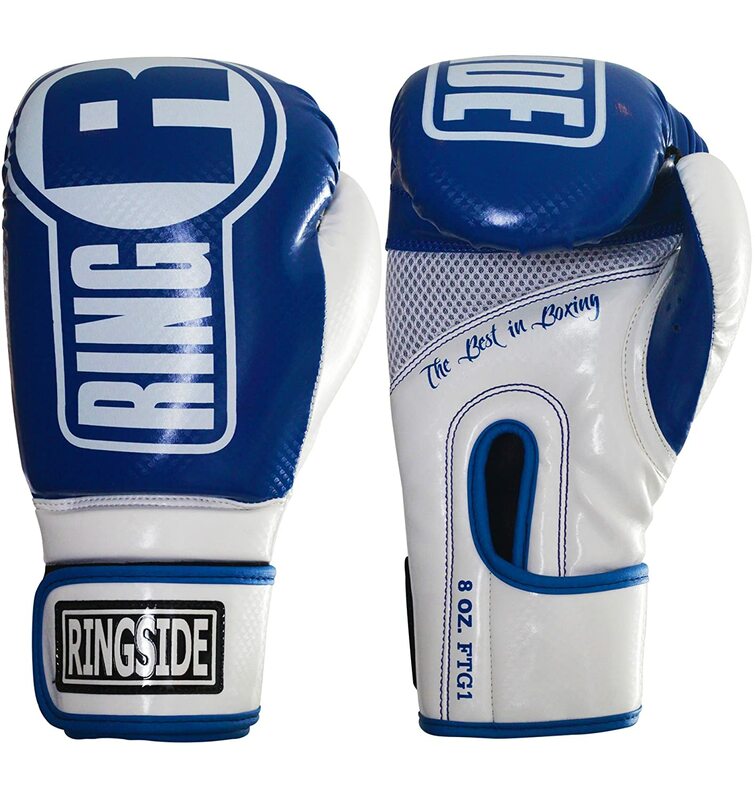 The Ringside comes in a range of sizes rather than weights. If you’re after some reasonably priced multi-discipline training gloves, check out the Ringside Apex. 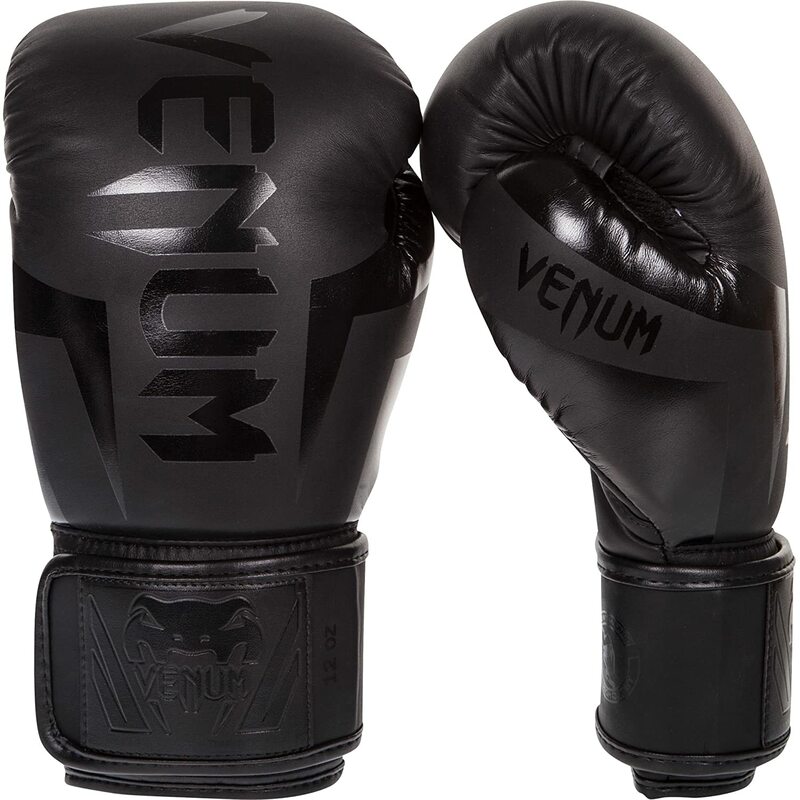 Designed in black-on-black, these Venum Elite boxing gloves look menacing and they’ll help you pack quite a punch on the heavy bag. These gloves come handmade from Thailand so if you’re looking for the cheapest punch bag gloves you can find, these are not for you. Skintex leather means you’ll get a supple and flexible fit while still being confident your hands and wrists will be properly supported against repeated strikes. The breathable mesh panel under the fist lets you work out without your hands feeling like they’re in a sauna. It’s this attention to detail that elevates these gloves from much of the competition. Triple-density foam is laid in with the rigors of the heavy bag in mind. Hopefully, you now have a shortlist of punch bag gloves to choose from depending on what type of protection you’re looking for. As long as you’re clear about your goals upfront and you take the time to get the best fit for you, securing the right pair of gloves for your heavy bag is child’s play. Drop us a line if you have any questions or feedback at all. We love to hear from our readers and we’ll help out in any way we can. Now go and give that bag a serious pummeling and come back soon! 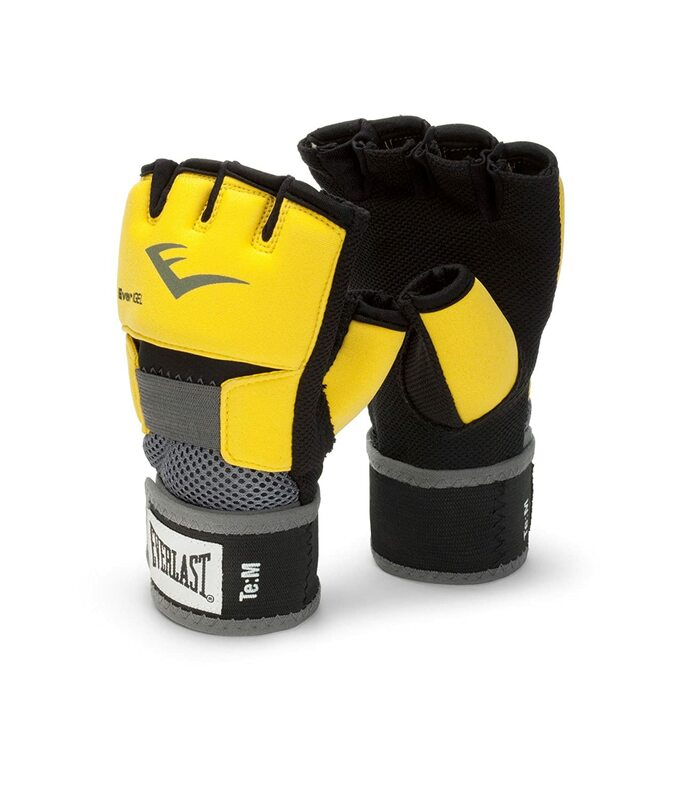 1) Everlast EverGel Hand Wraps Everlast is an enduring name in the fighting industry and you know you’ll get top-notch equipment at a fairly affordable price. These gel hand wraps are no exception. The knuckle protection and tightly elasticated straps give your hands and wrists all the support they need even if you’re hitting the bag particularly hard. There’s an EverGel protection system in place under the skin so you’ll get more than enough give from even the strongest strikes. Velcro wrist straps make the gloves a cinch to pop on and off while also helping to lock your wrist into place. Available in muted black or 3 much brighter colorways, these Neoprene hand wraps are extremely comfy while also built to last the distance. Cleaning these gloves is a breeze. All you need to do is pop them in the washing machine then it’s ding-ding, round 2! While these are not the cheapest punch bag gloves on the market, they are priced reasonably considering the impeccable brand heritage and the performance you’ll get in return. These gloves are suitable for use MMA training but they are best worn alone since the wraps are low-profile much like MMA gloves. If you’re boxing, these gel wraps can be worn inside your gloves giving you a valuable extra layer of protection. 2) TITLE Old School Heavy Bag Gloves TITLE is a household name in the boxing arena and these old school heavy bag gloves are exactly as described. Everything about these gloves from the design and color scheme through to the no-nonsense performance reeks of tradition. One of the key selling points of these punch bag gloves is the rare combination of affordability and build quality. You’ll get first-class gloves at a third-class price and you can’t ask for much more than that. The nifty pre-curved design allows you to close your fist optimally. The metal grip affords more stability and control even when you’re hitting that bag like a demon. These 8-oz gloves are made from genuine leather so you’ll enjoy a premium feel while the material will keep on going for years if properly maintained. The sizing means they work equally well on light or heavy punch bags. You can slip wraps under these gloves but it will end up as a pretty tight fit. 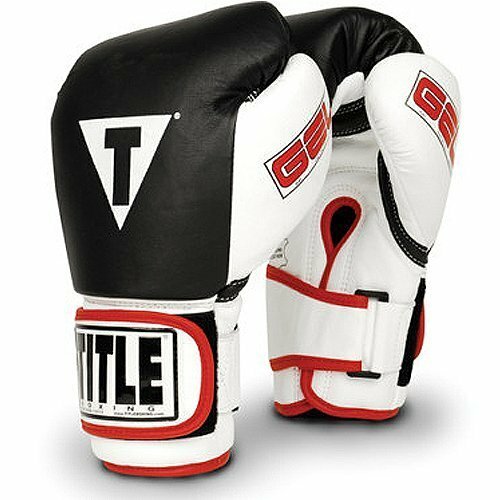 While you won’t end up with the support and protection offered by heavier gloves, if you want a versatile training solution for everything from sparring to bag work in a cost-effective and compact package, these TITLE 8-oz are hard to beat. 3) Everlast Mixed Martial Arts Heavy Bag Gloves The legendary Everlast makes another appearance with this fine set of gloves suitable for use on the heavy bag. Whether you’re sparring or leathering the heavy bag, whether you’re boxing or following mixed martial arts, these versatile gloves are a one-stop shop and will keep your hands safe from harm without bankrupting you. You can opt for large or extra-large in terms of sizing. The padding is 1-inch thick so even if you’re really motoring away on the punch bag or engaged in an especially rigorous sparring session, your hands will be cushioned from any jarring impact. Everlast market this as closed foam cell technology but the bottom line is your hands will be neatly protected. EverCool mesh ventilation panels let your hands breath even when you’re training hard. Laces might be a safe and stable solution, but the Velcro enclosures on these Everlast are ideal if time is tight and you prefer the ease with which you can slip these gloves on and off. As with all Everlast products, you’ll benefit from a 120-day guarantee so you’ve got no excuse not to give these gloves a try and see how nicely they shore up your hands and wrists even under heavy fire. You really have got nothing to lose. 4) Cleto Reyes Hybrid Boxing Gloves Cleto Reyes steps up to the bag next with the Mexican firm offering up some superb hybrid gloves that, while not cheap, still represent outstanding value for money. With over 70 years in the fight game, it’s no surprise that this brand has such a committed following. Harnessing the best of the lace system and hook and loop system combined, this hybrid glove is more suited to training than fighting. You’ll be able to get the gloves on and off quick smart while still enjoying the ultimate in stability and support. Rather than following the conventional labeling of gloves by weight, the Cleto Reyes come in sizes from extra-small through large so it’s worth trying these gloves before you buy. A rough sizing guide is provided by the manufacturer but it’s worth making sure they fit snugly first. Even if you plan to buy online, it’s not hard to visit a store and give some a feel. The hardwearing but supple leather lining keeps moisture safely out. Wiping them down and keeping them clean is a breeze. The lining could be improved but it’s more than fir for purpose. Stitching is rock solid and the overall craftsmanship of these gloves makes the price worth paying. Inside you’ll get latex foam padding which will cushion your knuckles while ensuring your wrists don’t feel too much backlash. This padding is fairly thin but not too firm. The wrist area feels very supportive taking added stability from the Velcro straps. There’s a thin bar stitched in to help you make a fist more comfortably. The logo-heavy design is otherwise pretty minimalist. If you like a burst of color in the gym, these gloves come in an array of striking schemes. If you’re looking for the cheapest punch bag gloves, the Cleto Reyes hybrids are not for you. If, however, you want to invest in a durable pair of training gloves that will return many happy years of punching, they make an extremely wise bet. 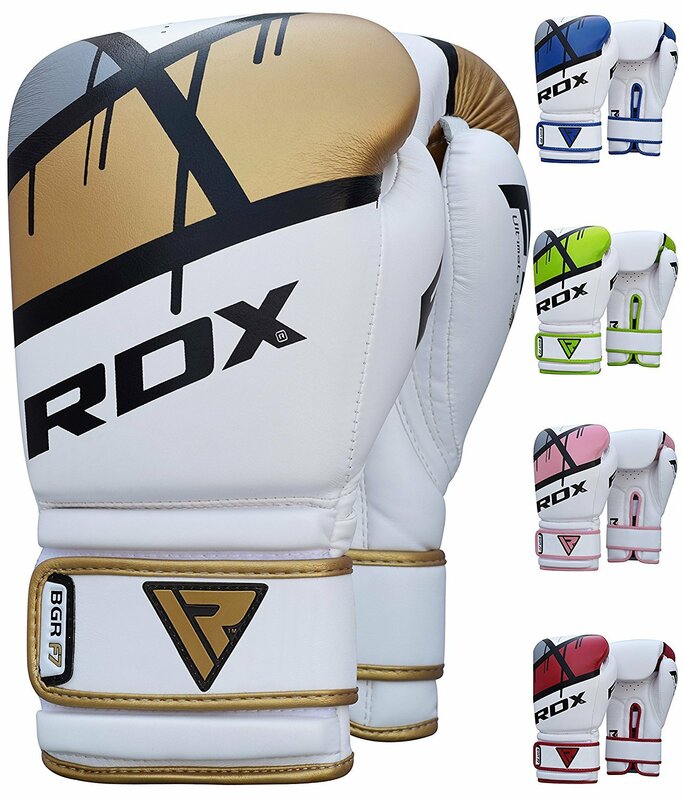 5) RDX Hide Leather Punching Bag Mitts Marketed as punching bag mitts, these leather gloves from the highly reputable RDX deserve a place on any shortlist. The core of these RDX is white and you can choose from a range of color accents to set off the sleek design. Made from Maya leather, you’ll get a winning combo of comfort, lifespan and performance. Extra-thick foam keeps your knuckles well protected even if you’re really battering the bag. You’ll also get a separate block over your wrist with a gel insert so you can safeguard against any injuries with a pair of these punch bag gloves. RSX rolls out their Quadro-Dome technology so that when you strike the bag the force ends up smoothly distributed while reducing any jolting impact. This also stops your hands suffering from the stresses you can otherwise experience. Slipping the gloves on and off is simplified by a lengthy Velcro strap giving you plenty of room for maneuver. The hook and loop enclosure guarantees a nish fit offering ample wrist support even if you pound the bag hard. If you’re after some rugged but comfortable training gloves from a brand you can trust, these RDX mitts are the obvious choice. 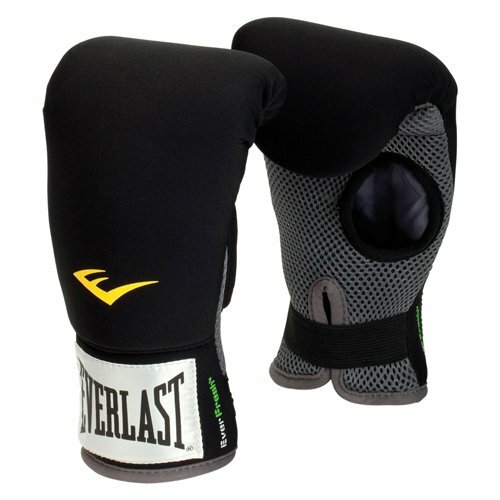 6) Everlast Neoprene Heavy Bag Gloves As Everlast dominate the boxing scene so heavily, it’s no surprise to see another entry from this industry titan with these Neoprene gloves ideal for a session on the heavy bag. Neoprene construction gives you all the flexibility you need when striking along with the durability essential if you want value for money. Padding on the palm gives you all the support necessary for a demanding workout on the heavy bag. The liner is efficient at keeping moisture well away so you can train for hours without worrying about sweat seeping in. The wrist wrap is tightly elasticated so you’ll get it on and off with ease while also benefiting from outstanding support. If you’re looking for flashy and colorful gloves then these Everlast are not for you. If, on the other hand, you want an understate punch bag glove capable of returning many years of training on your investment, these Neoprene beauties make a perfect fit. 7) Ringside Apex Punching Bag Mitts Ringside make another appearance with these budget-friendly gloves that deliver top-tier performance at a bargain basement price. If you’ve ever trained with poorly lined gloves for lengthy spells, you know how your hands can end up wrinkled as though you’ve been in a hot bath for too long. The Sta-Dri lining on these gloves puts paid to that as the name suggests with all moisture kept on the floor of the gym rather than your hands. Injection-molded foam makes for a very absorbent glove allowing you to focus on your training rather than being distracted by aches and pains from a poorly-padded glove. The pre-curved design helps keep your hands aligned when you’re striking hard. The grip bar helps you keep your fist clenched for longer. The main enclosure is a hook and loop system while wrist enclosures are tapered for added support. Although marketed as mixed martial arts and Muay Thai mitts, the Apex work equally well if you’re a boxer. The Ringside comes in a range of sizes rather than weights. If you’re after some reasonably priced multi-discipline training gloves, check out the Ringside Apex. 8) Venum Elite Boxing Gloves Designed in black-on-black, these Venum Elite boxing gloves look menacing and they’ll help you pack quite a punch on the heavy bag. These gloves come handmade from Thailand so if you’re looking for the cheapest punch bag gloves you can find, these are not for you. Skintex leather means you’ll get a supple and flexible fit while still being confident your hands and wrists will be properly supported against repeated strikes. The breathable mesh panel under the fist lets you work out without your hands feeling like they’re in a sauna. It’s this attention to detail that elevates these gloves from much of the competition. Triple-density foam is laid in with the rigors of the heavy bag in mind 9) Everlast Pro Style Training Gloves 10) TITLE Gel World Bag Gloves OK… Now you’ve seen a wide range of the very best punch bag gloves up for grabs, why do you even need gloves if you’re just training anyway? Hopefully, you now have a shortlist of punch bag gloves to choose from depending on what type of protection you’re looking for. As long as you’re clear about your goals upfront and you take the time to get the best fit for you, securing the right pair of gloves for your heavy bag is child’s play. Drop us a line if you have any questions or feedback at all. We love to hear from our readers and we’ll help out in any way we can. Now go and give that bag a serious pummeling and come back soon!